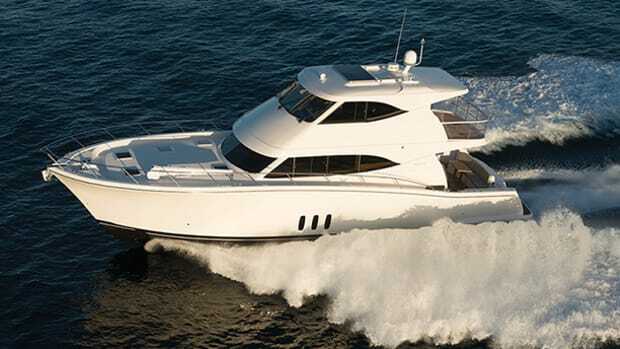 Maritimo’s Aegean 55 succeeds by leveraging a proven formula and keeping things simple. 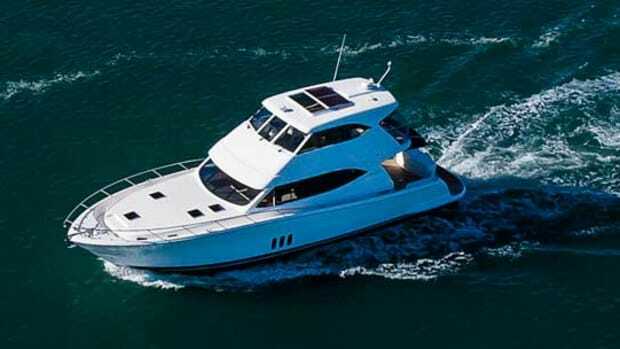 Ever since it began building boats back in 2003, Maritimo’s been known for a laser-like focus on efficiency. In the performance realm, this is typified by an insistence on minimizing propshaft angle in the belief that the closer it comes to straight horizontal the greater proportion of the engine’s output will be translated into forward thrust. Maritimos typically employ a shaft angle of around nine degrees compared to a conventional angle of 12 to 15 degrees. Naval architects I’ve spoken to are divided on the validity of this theory, but looking at PMY’s tests of Maritimos over the years, it’s fair to conclude that these boats do indeed excel in terms of efficiency. 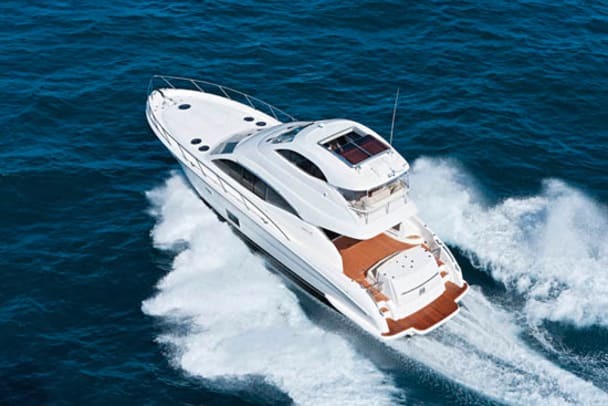 But Maritimo’s focus on efficiency isn’t limited to engineering. 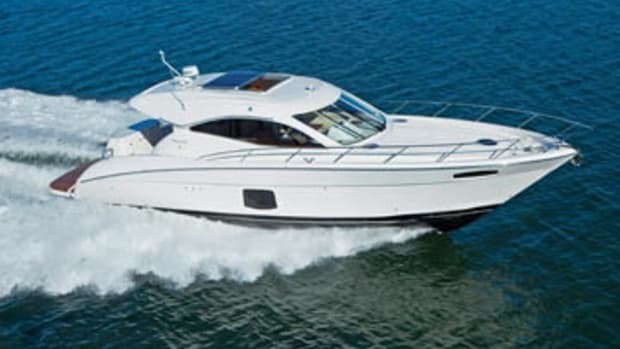 This company expends great effort on the development of each hull, and then, having gotten it right, strives to use it in as many configurations as possible. 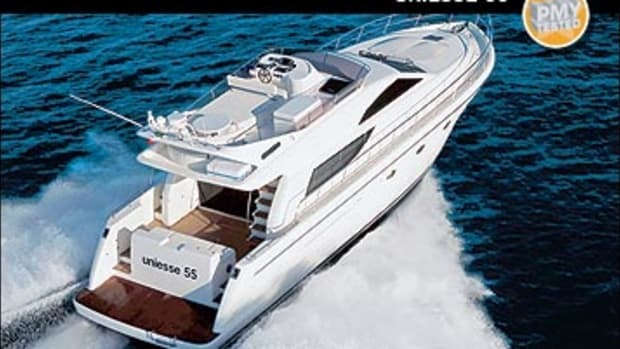 So it first created the Cabriolet (no bridge) 55 and then, in March 2009, used that hull for the Aegean 55, which has an open bridge but a more truncated one than the 56 Motoryacht. 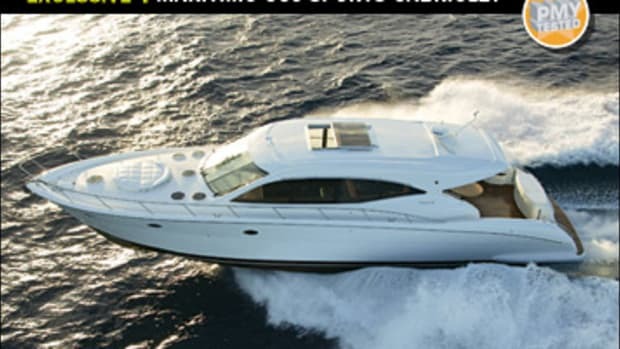 From that boat, it created the Aegean 55 Enclosed Flybridge, Hull No. 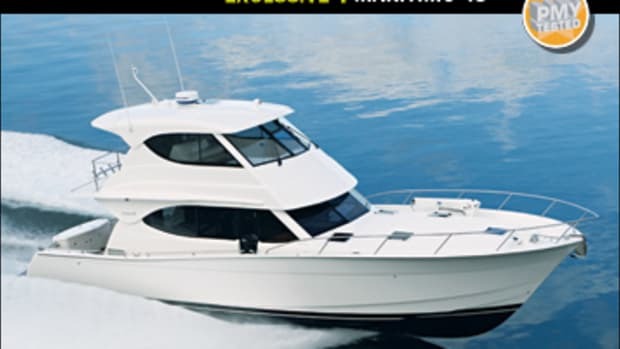 1 of which I tested in May at the Sanctuary Cove Boat Show in Gold Coast, Australia, just a few miles from the Maritimo factory. The differences between Aegeans and Motoryachts are subtle on paper but clear in person. 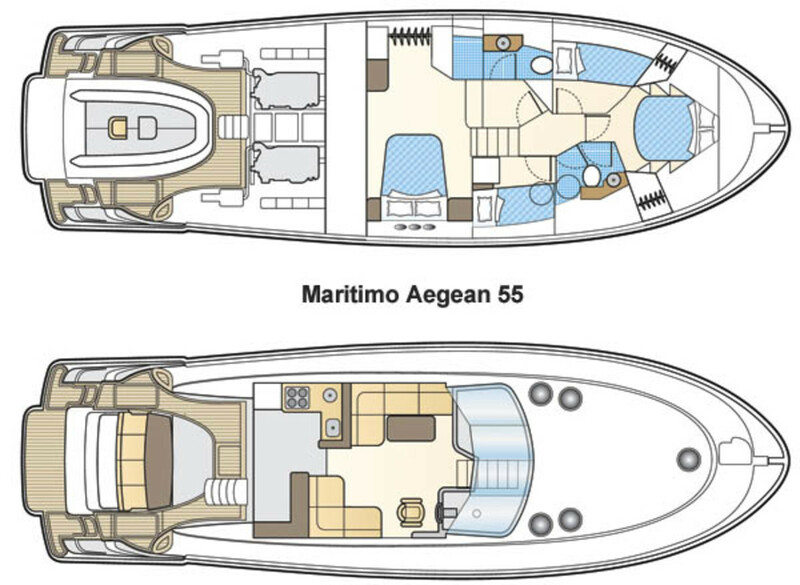 The Aegean’s entry is more raked and its bridge deck is shorter; there is no large cockpit overhang as on the Motoryacht. 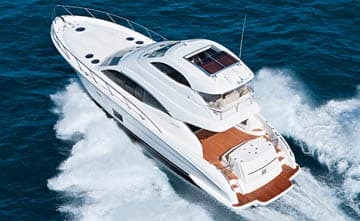 The result is a sleeker, sportier profile that leads one to conclude the Motoryachts are the more serious cruising boats, even though the Aegean I tested—equipped with optional 715-hp Volvo Penta D12s instead of standard 715-hp Cummins QSM11s—enjoyed a minimum range of 380 miles. (The D12 has since been replaced by the 900-hp D13, which is a no-cost option on the A55.) Adding to the sportiness is a garage, also standard on Cabriolets; it opens electrically for easy launching of a PWC or RIB. The popularity of garages has waned in recent years mainly because in exchange for their greater convenience they often subtract space from the engine room or accommodation space—or even both. That’s definitely not the case with the A55, whose engine room is remarkable for its openness. Why? Because not only does Maritimo like its engines to have shallow shaft angles, it likes them to be a bit closer together—I measured 5&apos;4" from propshaft to propshaft—which is possible in part because on a Maritimo, prop pockets are verboten. All this goes to explain how it was that I measured 1&apos;8" outboard of each Volvo D12, 1&apos;3" in front of them, and well over two feet to their rear. That’s some serious access space. In front of the engines there’s that trademark single fuel tank, which comes complete with sight gauge. But there is only a single Racor 1000MA fuel-water separator for each main, instead of duplexes, along with a single 500MA for the standard 17.5-kW Onan genset, all in a modular panel that is used on other Maritimos. Single Racors on the mains is an anomaly for sure, mainly because it’s not possible to change the filter elements without stopping the engine to which they are attached. I can’t remember the last time I have been on a boat larger than 50 feet that didn’t have duplex separators. If no spatial compromise is visible in the engine room, neither is one in the accommodation level. 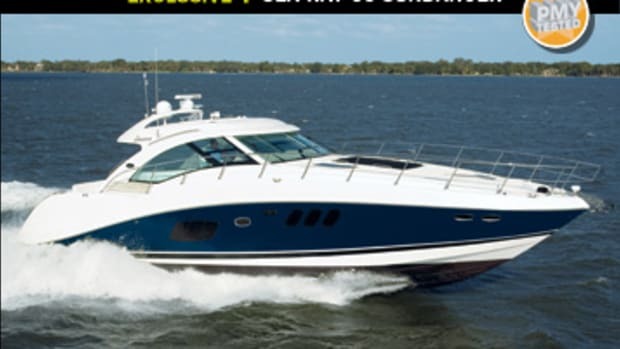 There are four staterooms, a noteworthy tally for a 57&apos;10" vessel. True, only the master has en suite facilities; the other three—two bunk rooms and a forepeak VIP—share the starboard-side head; the VIP has direct access. Relatively large and including an enclosed shower, the head’s basic design is duplicated on other Maritimos—another savvy use of resources. Being at the foot of the companionway, it also functions as a day head. The A55’s 7&apos;2"-long cockpit is separated from her saloon by another commonality: a three-piece aluminum-and-glass door. One panel swings open while the other two are bi-fold, which gives you a nearly full-width opening with doors laying flat at both sides, out of the way—a great blending of interior and exterior spaces that doesn’t take up a bit of valuable floor space. The aft galley, yet another Maritimo trademark and a feature showing up on more and more boats, promises to make outside dining as hassle-free as is possible on a boat. From the cooktop to the cockpit dining table (not included), it’s no more than a half-dozen steps. In the saloon itself, there is no option for a lower helm, which makes for a much more spacious and uncluttered lounging area. There was no TV installed here on my test boat (or anywhere else onboard for that matter), but a saloon TV is listed as standard equipment. Presumably they are fitted when the boat arrives stateside. In any case, stateroom TVs are one of the few options on the boat. 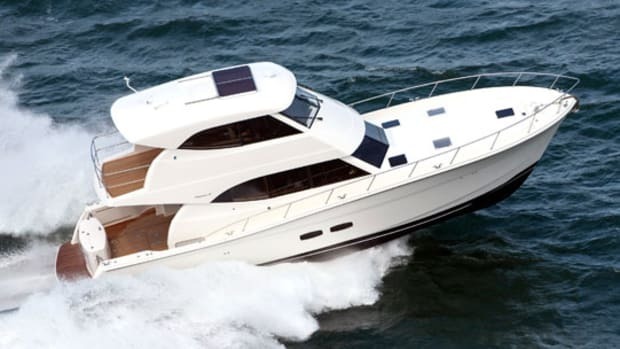 Literally everything else (save our boat’s D12s) is standard, except for navigational electronics, which makes comparison shopping a lot easier. 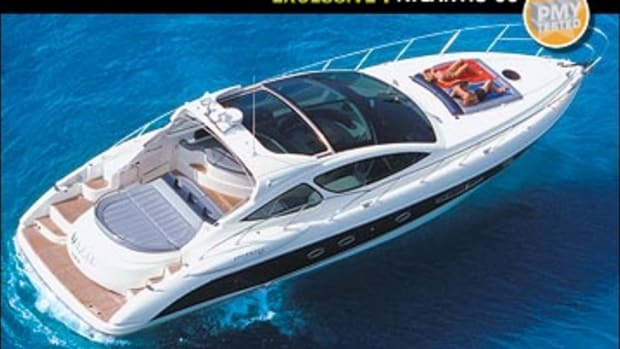 The lack of a TV in the saloon wouldn’t be a problem anyway as the real gathering place on this boat is sure to be the enclosed bridge, given its superb views, standard sunroof, easily scaled interior stairway, and dedicated air conditioning. And because it’s hard-enclosed on only three sides—the aft side is covered by canvas—it’ll be especially attractive on cooler days and evenings. Because test day brought only benign conditions, I can’t fairly judge the 55’s rough-water mettle. I can however comment on her responsiveness to helm input. Maritimo designs and casts its own rudders and props, and the result is a well-integrated powertrain with good helm response. However, I did find the 55’s turning radius—I’d guess it to be four boat lengths at full speed—a bit on the wide side. The Aegean 55 is a boat that perfectly displays Maritimo’s uncanny ability to get maximum use out of the technology and components it has developed. It’s a strategy that virtually eliminates unpleasant surprises and also produces a lot of boat for the money. And since every boat is turnkey, save electronics and stateroom TVs, your boat-buying process will be as simple as it is worry-free.